Philosophy Professor and Director of the Center for Comparative Philosophy Anand Vaidya will launch the Spring University Scholar Series on February 21. 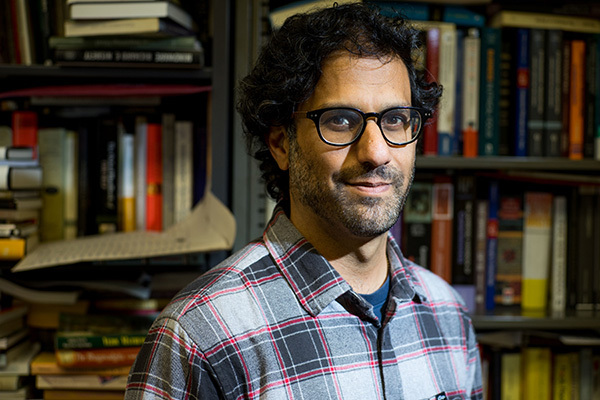 Professor of Philosophy and Director of the Center for Comparative Philosophy Anand Vaidya and Associate Professor of Communicative Disorders and Sciences Nidhi Mahendra have more in common than participating as speakers in this spring’s University Scholar Series. They both discovered a passion for their academic specialties as undergraduate students and remain just as enthusiastic – though much more experienced – today. Vaidya will launch the spring 2018 University Scholar Series with a lecture entitled, “The Project of Cross-Cultural and Scientifically Informed Critical Thinking,” on Feb, 21, from noon to 1 p.m. in the Dr. Martin Luther King, Jr. Library 225/229. Vaidya first discovered philosophy as a freshman at Humboldt State University when he took classes on medieval philosophy and logic and critical thinking. Since then, he has engaged in thinking about the subject from the perspective of philosophy of mind, cognitive science, epistemology and comparative philosophy. His most recent interest in cross-cultural and multi-disciplinary approaches to logic and critical thinking arose when he read journalist and friend Jessica Kraft’s article in The Atlantic about hip-hop as a technique in college debate. “The article led me to inquire into the way I teach logic and critical thinking, and whether I was unintentionally excluding some people from engaging in critical thinking simply through the method by which I was teaching them,” he said. He began to research non-western philosophy traditions, traveling to India, New Zealand, Hawaii and Japan during a sabbatical. Vaidya sees San Jose State University as a place that can pioneer the development of a new critical thinking model that is informed by a cross-cultural investigation into tools from traditions as distinct as Arabic and Zen philosophy. “We have a unique opportunity to do this because we have a diverse student population that can engage in the very construction of this new model, and because our connection with technology in Silicon Valley provides us with an opportunity to actually build tools, such as smartphone applications that can help our students learn and engage in better critical thinking,” he said. She has been working clinically, conducting research and teaching with persons with neurological disorders such as Alzheimer’s disease and stroke for 20 years. In her lecture, she will share research on the power of rehabilitation for patients with communicative disorders following a stroke or due to Alzheimer’s disease. She recalls that as an undergraduate she observed a patient who had a stroke and lost the ability to talk and walk overnight. “I remember being so moved by the experience and thinking about how I might be able to help,” she said, noting that her interest in dementia also has a personal connection as one of her grandparents developed the disorder after suffering from mini strokes. All lectures are free and open to the public. Lunch will be provided. See fliers for more details on the series.